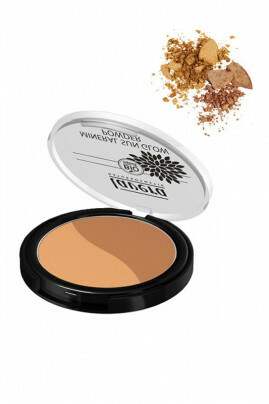 Vegan Golden Mineral Sun Glow Powder gives you a luminous and naturally tanned complexion. The combination of its two warm shades highlights the color of your skin by providing a natural tanned effect. Thanks to its illuminating minerals like mica, say goodbye to the dull complexion and the gray mine. Its natural pigments reflect light and bring radiance to your complexion. Its fine and light texture is gently deposited on your face for a totally natural effect. The secret of a summer and sunny complexion all year long? A touch of Vegan Golden Mineral Sun Glow Powder on your skin, healthy effect guaranteed! Using a powder brush, mix the 2 tans and apply the powder on your face. Start with the cheeks from the top of the cheekbones and the nose and chin. Blend to the demarcation of the neck. The Lavera Vegan Golden Mineral Bronzing Powder has a natural composition !